On Thursday, May 18, at noon, listen to a half-hour discussion with me and host Steve Leal on the Leal All Things Political radio show on 1210 AM KEVT. If you have any questions during the show, dial the call-in number, 520-807-7092. On Friday, May 19, at 6 pm, a special “Say No to Monsanto” Meal/Mixer hosted by me, GMO Free Arizona, and Toxin-Free Pima County Coalition will take place at The Tasteful Kitchen, 722 North Stone Avenue. Not only will you will be able to order from a special menu of non-GMO appetizers, entrees, or a multi-course, farm-to-table meal, but you also can help us celebrate the launch of our yard sign campaign to make Pima County toxin free! We’ll have two different yard signs available by donation at the event, and we’d love for you to celebrate with us and be one of the first people to get a yard sign! Be sure to make your reservations now by calling 520-250-9600. On International March Against Monsanto Day, Saturday, May 20, at 2 pm, attend a special FREE screening of the documentary, SEED: The Untold Story, at the Murphy-Wilmot Library, 530 N. Wilmot Road. It will be followed by a discussion and Q & A with me and a representative from the Seed Library of the Pima County Public Library. Local resources and solutions will be offered! Bring a friend and your own water bottle. Seed: The Untold Story covers surprising information about how chemical companies control the majority of our seeds, and how farmers, scientists, lawyers, and indigenous seed keepers are fighting a David and Goliath battle to defend the future of our food. It is presented in partnership with GMO Free Arizona, Toxin-Free Pima County Coalition, Food Conspiracy Co-op, Pima County Public Library, and Seed Library of Pima County Public Library. The last time this movie showed in Tucson – at the 500-seat theater at The Loft Cinema – it sold out! Seating is limited at this special event, so plan to arrive early to get a good seat. 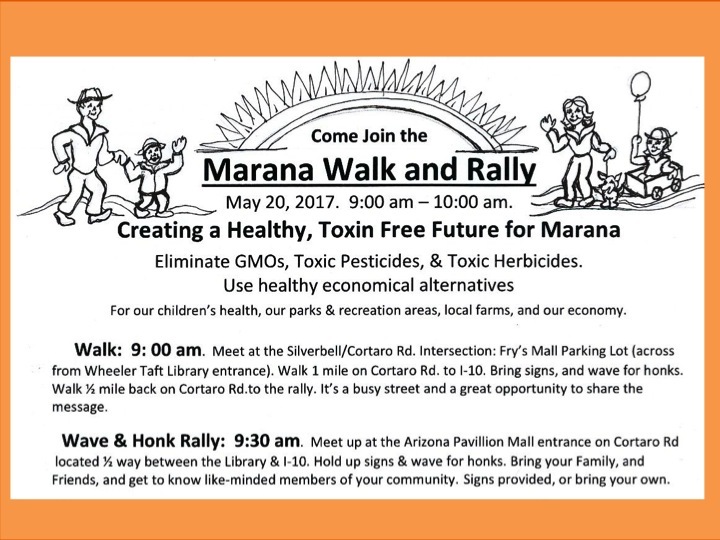 Finally, if you feel like marching against Monsanto and for a toxin-free Pima County on Saturday, May 20, you can participate in a Walk and Rally in Marana starting at 9 a.m. at the Fry’s Mall parking lot (across from the Wheeler Taft Library entrance) at the Silverbell/ Cortaro Road intersection. You also can come for just the Rally at the Arizona Pavilion Mall entrance on Cortaro Road at 9:30 am. Signs will be provided. (Click on the picture to read more of the details.) Take note: I will not be at this Walk and Rally. They are being led by GMO Free Arizona and Toxin-Free Pima County Coalition member Marilyn Newberry.